PLANITHERM is Europe’s best selling high performance low-emissivity glass, incorporating the very latest advancements in thermally insulating glass coating technology. 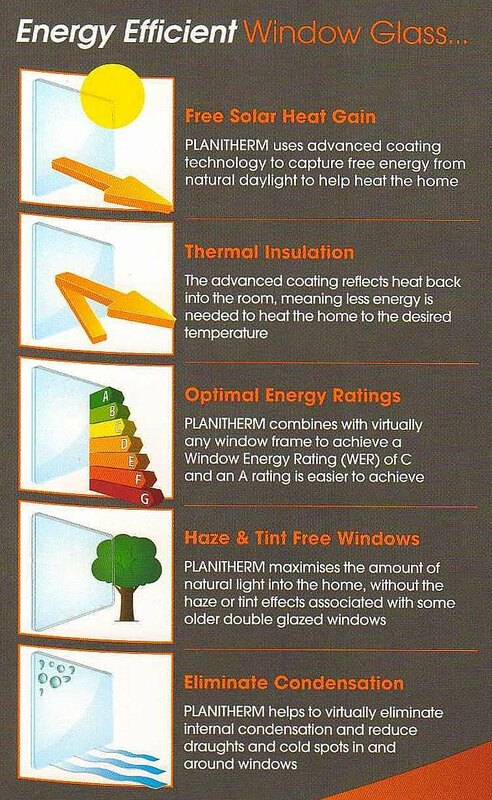 PLANITHERM is rapidly becoming recognised as the low-E glass of choice when it comes to achieving the best possible Window Energy Ratings. With its transparent metallic coating PLANITHERM reflects heat from radiators or fires back into the room, rather than allowing it to escape through windows. At the same time this coating allows free heat and light from the sun to pass through the glass, warming the room and further conbtributing to the energy efficiency of windows. PLANITHERM offers many additional features which set it apart from traditional low-E products, helping to give you an added edge when selling to the discerning consumer in an increasingly competitive market. PLANITHERM can also be readily toughened to meet the requirements of BS EN 12150 for applications requiring safety glass.